Windows Vista is the name of the upcoming release of Microsoft Windows, a line of graphical operating systems used on personal computers, including home and business desktops, notebook computers, and media centers. Prior to the announcement of the Vista name on July 22, 2005, it was known by its codename Longhorn. As of November 2006, Windows Vista is getting ready for release to manufacturing; Microsoft has stated that the scheduled release dates are currently November 30, 2006 for volume license customers. Worldwide availability is expected to be on 2007 January 30.These release dates come more than five years after the release of Windows XP, Microsoft's current consumer and business operating system, making it the longest time span between major releases of Windows. 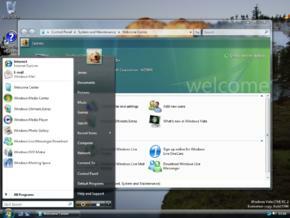 According to Microsoft,Windows Vista contains hundreds of new features, some of the most significant of which include an updated graphical user interface and visual style dubbed Windows Aero, improved searching features, new multimedia creation tools such as Windows DVD Maker, and completely redesigned networking, audio, print, and display sub-systems. Vista also aims to increase the level of communication between machines on a home network using peer-to-peer technology, making it easier to share files and digital media between computers and devices. For developers, Vista introduces version 3.0 of the .NET Framework, which aims to make it significantly easier for developers to write high-quality applications than with the traditional Windows API. Microsoft's primary stated goal with Vista, however, has been to improve the state of security in the Windows operating system. One of the most prevalent common criticisms of Windows XP and its predecessors are their commonly exploited security vulnerabilities and overall susceptibility to malware, viruses and buffer overflows. In light of this, then Microsoft chairman Bill Gates announced in early 2002 a company-wide 'Trustworthy Computing initiative' which aims to incorporate security work into every aspect of software development at the company. Microsoft claimed it prioritized improving the security of Windows XP and Windows Server 2003 above finishing Windows Vista, significantly delaying its completion. During the course of its development, Vista has been the target of a number of negative assessments by various groups. Criticism of Windows Vista has included protracted development time, more restrictive licensing terms, the inclusion of a number of new Digital Rights Management technologies aimed at restricting the copying of protected digital media, and the usability of new features such as User Account Control. Thanks for visiting Gaurav's Site.